No New Chairlift for First Time in 63 Years? No chairlift installations are currently scheduled for the 2016 off season. With the 2015-16 season going down as the worst in modern history, and with uncertainty in the real estate investment trust and banking industries, it appears no new chairlifts may be installed in New England this summer. Previously rumored chairlift installations at Sunapee, Berkshire East, Pats Peak, and Loon will not take place in 2016. The projects have been reportedly delayed until future off seasons. The 2016 off season could be the first since 1953 to not produce a new chairlift in New England. 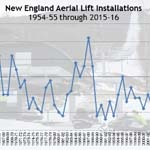 As previously reported on NewEnglandSkiIndustry.com News, new lifts were still installed after prior devastating winters. At present, it appears the only potential 2016 chairlift installations would be at Saddleback and Waterville. Saddleback would potentially seek a replacement for its Rangeley double chairlift if the ski area is sold. As of March 15, the area has neither operated nor been sold. Meanwhile, Waterville Valley has not ruled out installing a new or used chairlift on Green Peak this year, but is not expected to make an announcement until the end of April. 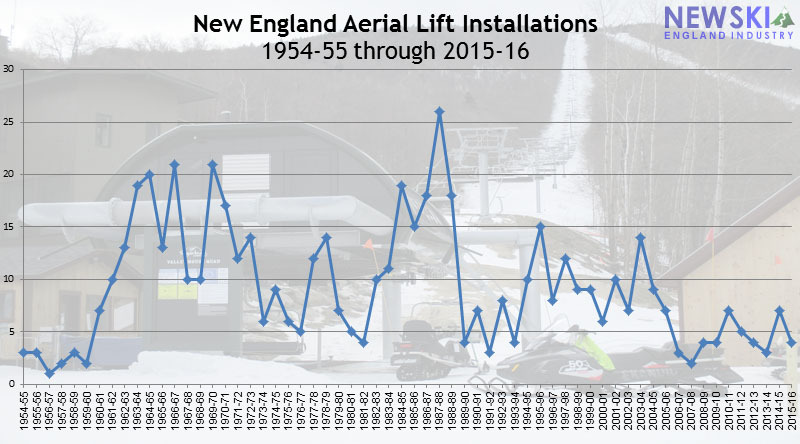 Four chairlift installations were completed in New England last off season, the second lowest number in modern history. Three of the installations were brand new chairlifts. At present, the only other proposed lift installations in New England for 2016 are a private racing T-Bar at Cannon Mountain, NH and a platter lift at Ascutney, VT.